Cure Strategy (formerly, Serious Medicine Strategy): Helping the paralyzed to walk--can Uncle Sam compute the value of that? Helping the paralyzed to walk--can Uncle Sam compute the value of that? 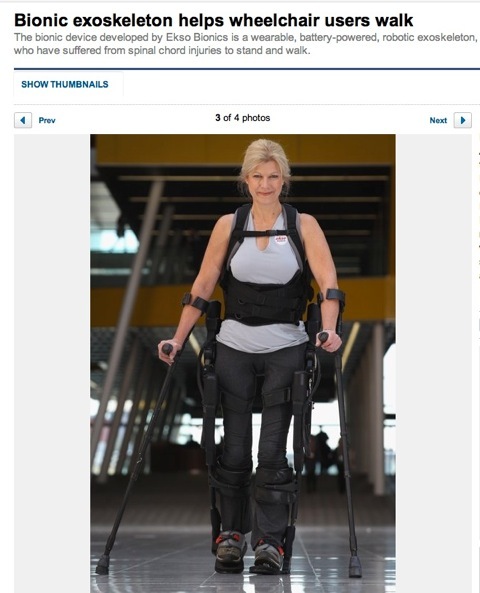 A company called Ekso Bionics has developed a wearable, battery-powered exoskeleton that enables the paralyzed to walk; that's one Amanda Boxtel, above, walking for the first time in a long time. A very heartening story--and it's not just a story, it's real. No doubt such exoskeletons are expensive, although, of course, the price will fall if and when they are mass-produced and new competitors enter the market. Of course, if the US government were to buy such bionic devices for, say, America's wounded warriors coming back with crippling injuries from Iraq and Afghanistan, that expenditure would simply be measured as a cost by the Congressional Budget Office. Given the tenor of the times, it's a safe bet that the bean-counters who rule Washington these days will say that we can't afford it. Would the CBO even attempt to score the possibility that more wounded warriors would be able to go back to work, and be more productive? And of course, the way things work in DC these days, if CBO doesn't score it, then it has not happened. Moreover, if we had built this exoskeleton industry here at home, then the cost of buying the equipment would be balanced by the jobs and profits that we would be generating here on the home front. Maybe I'm being sarcastic Jim, but I don't think the "Hill People," at least the current cadre, can think outside their Erector Sets! Is any expense for something that works too high for the guys and gals who spent time in Iraq or Afghanistan? In a perfect world,the US Government would do anything in it's power to help the war veterans with such exoskeletons,as a "Thank You" for all you did for us. But in the real world,they are just gonna say "No"...and that's it.They fought and risked theyr lives at what cost? Great that this type of system is develop for those who having disabilities. I am feeling glad that I know about it, now I will suggest for it if any one required..